"As we speak, cars in Boston and factories in Beijing are melting the ice caps in the Arctic, shrinking coastlines in the Atlantic, and bringing drought to farms from Kansas to Kenya. This is the moment when we must come together to save this planet. Let us resolve that we will not leave our children a world where the oceans rise and famine spreads and terrible storms devastate our lands. Let us resolve that all nations - including my own - will act with the same seriousness of purpose as has your nation, and reduce the carbon we send into our atmosphere. This is the moment to give our children back their future. This is the moment to stand as one." If elected, does this mean Barack Obama will take meaningful measures against climate change? Or is he - like everybody else seems to be - just talking? 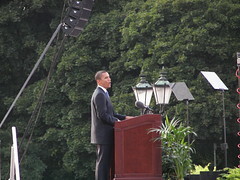 Barack Obama surely didnâ€™t look like he only was a presidential nominee in Berlin tonight. He behaved and he talked like a real president should. No matter what you believe about his political views and ideas he surely is, in my opinion, the only real candidate for the job in this election. It would be the biggest blunder of the century if the people of USA fail to vote Obama into office. You can watch Obama's speech below and/or read the full speech transcript in our forum.